Canadian journalist and author Andrew Nikiforuk presented a book talk and launch of his newest book, Slick Water, at Rosebud’s Community Hall, Sept. 12. The event was attended by over 75 people from numerous Alberta communities including Rosebud, Drumheller, Kathyrn, Didsbury, Red Deer, Fox Creek, Airdrie and Lethbridge. Guests from the Green Party, Wheatland County Council, University of Lethbridge and Greensence Environmental were also present, as were representatives of Rosebud Theatre and Rosebud School of the Arts. Slick Water, subtitled Fracking and One Insider’s Stand Against the World’s Most Powerful Industry, centers on the story of Jessica Ernst, a Rosebud-area resident who’s been engaged in a lawsuit against Encana, the Alberta Energy Regulator and the Alberta government since 2008, when she reported that fracking had made her well water undrinkable and unsafe to use. Nikiforuk presented the history and evolution of hydraulic fracturing, informally known as fracking. He explained that fracking involves injecting water, sand and chemicals into underground rock at high pressure, in order to release the petroleum resources attached to that rock. As much greater force is now used in the process than when fracking began in the mid-19th century, there’s growing risk that harmful levels of gases such as methane will be released into surrounding aquifers. Ernst also spoke, receiving a standing ovation when she was introduced and another when she concluded. She said she’d come to Rosebud to live a quiet, peaceful life, but when her water was ruined, she wanted accountable people to be accountable, but they wouldn’t. So she took on a legal case that’s ended up lasting over seven years. It has taken a toll on her physical body, and brought worldwide attention to fracking, to Rosebud and to Ernst herself. Ernst said she hears from engineers and other oil and gas workers who express concern about the risks of injury that fracking poses to themselves and their fellow workers. They also refer to the contamination of groundwater. She said they ask themselves, ‘do we want to be poisoning children?’. She expressed hope that we can find a better way to obtain energy. After the presentations, Nikiforuk and Ernst answered audience questions, which indicated audience members’ support for Ernst in her lawsuit, concern about the safety of their own water, and an increased desire to challenge the practice of fracking, both provincially and globally. Award-winning author Andrew Nikiforuk will launch his newest book, Slick Water: Fracking and One Insider’s Stand Against the World’s Most Powerful Industry, in Rosebud, Sept. 12. Nikiforuk will speak and answer questions about issues related to fracking – formally known as hydraulic fracturing – and its impact on fresh water supply. Nikiforuk is starting his book tour in tiny Rosebud, explained Shauna Murphy, the event’s emcee and a long-time Rosebud resident, because the book centers on the story of Jessica Ernst, who lives on the edge of the hamlet. Ernst became concerned about her well water, according to a prepared statement, when her dogs refused to drink it, and it gave her caustic burns. Ernst, a former consultant for the oil and gas industry, believes her family’s water was ruined by fracking. In 2008, Ernst began a lawsuit against Encana, the company responsible for fracking the community’s drinking water aquifers, as well as against various Alberta government bodies. The lawsuit is ongoing, and Ernst recently earned the right to have her appeal heard in the Supreme Court. She hopes to see a large, diverse crowd at the event, but that it’ll do much more than sell the book. She wants people to use it as an opportunity to learn about fracking, and have their questions answered. Encana and government representatives will be personally invited, and Murphy emphasized that she hopes they’ll come too. 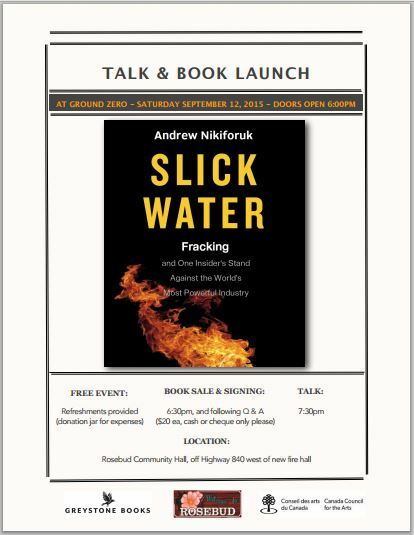 Rosebud, Alberta – Investigative journalist Andrew Nikiforuk launches Slick Water at Ground Zero Saturday, September 12, presenting a book talk, followed by Q and A.
Slick Water reveals the shocking story of Jessica Ernst’s determined stand to hold Encana, and Alberta regulators accountable for damages caused by fracking. 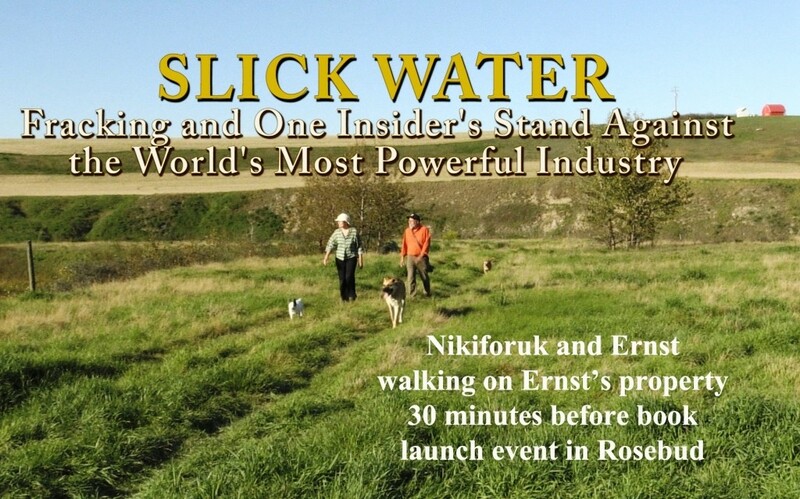 When Ernst’s dogs refused to drink her well water and she suffered caustic burns from it, the oil patch consultant began asking questions; she discovered Encana had secretly fracked hundreds of gas wells around Rosebud in the fresh water zones. After Ernst filed her lawsuit and put forward evidence that Encana had violated laws by fracturing the community’s drinking water aquifers, she was falsely tagged as a bomb-making terrorist and harassed by the Harper government’s anti-terrorism squad. Frightened but undaunted, she uncovered a startling history of liability, fraud, and intimidation, along with a willful denial of widespread groundwater contamination. In his powerful work, Nikiforuk interweaves Ernst’s story with the history and science of fracking, as well as human and environmental harms left in its wake. 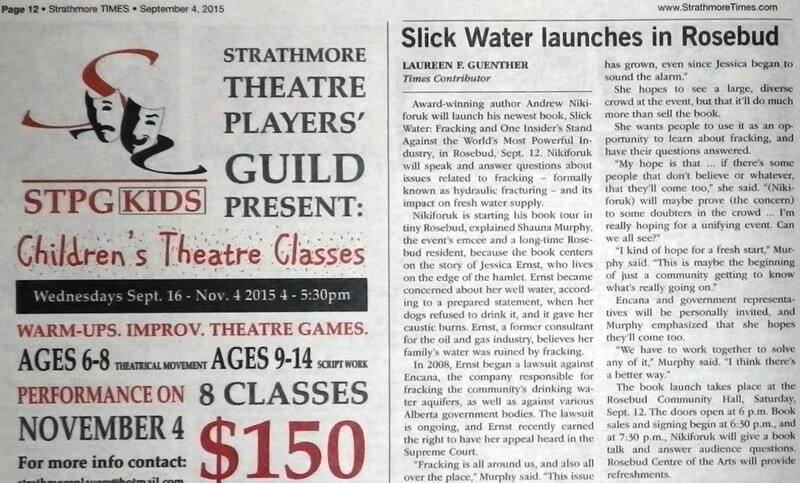 Slick Water is published by Greystone Books and was partly funded by The Canada Council for the Arts.